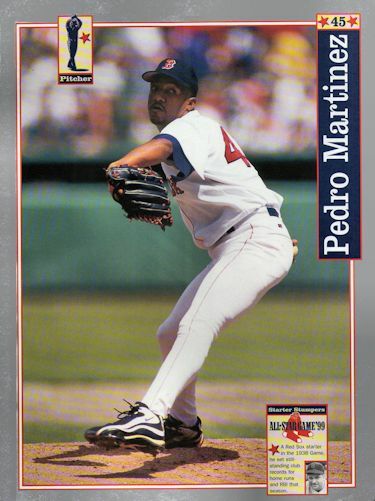 ON THIS DATE (June 4, 1999) ... American League, National League, interleague, it doesn't make any difference to Pedro Martinez, who elevated the bar on his own magnificence by striking out a career-best 16 in a three- hit, 5-1 win over the Atlanta Braves in a Fenway Park teetering on pandemonium. Pedro, who lowered his earned run average to 1.91, best in the majors, gave up a leadoff single to Javy Lopez in the second, a leadoff double to Andruw Jones in the fifth, and lost his shutout when Ryan Klesko curled his seventh home run around the Pesky Pole with one out in the seventh. He struck out at least one batter in every inning, and ended seven of his nine innings with a K, which guaranteed him a frenzied reaction from the sellout crowd of 33,411 each time he slowly made his way back to the dugout. The crowd was never happier than in the ninth, when Pedro, who had thrown 104 pitches through eight, headed back to the mound to put the finishing touches on his second complete game. He struck out Chipper Jones for his 15th whiff, matching the career best he'd achieved twice this season. Brian Jordan was caught looking for No. 16. Javy Lopez then had two strikes on him before grounding out to third baseman John Valentin to end the game. Pedro, who retired the last eight Braves, struck out every batter in the Atlanta lineup at least once. He struck out cleanup hitter Jordan four times. He struck out Gerald Williams, the No. 9 hitter, three times. When he had a runner on third and no outs in the fifth after Jones's double and a wild pitch, he struck out Randall Simon and Williams and put away Walt Weiss on a pop to short.